85% of Women Wear The Wrong Size Bra! You've heard it on Oprah, Rachel Ray, The View, Regis and Kathy, and even Jay Leno! ...you need a bra to do what it is supposed to do - lift you up, not let you down! Department store bras typically come in only 32 cup sizes. So the average woman in search for the right cup, tends to go up in the band size (30-32-34-36-38-40-42-44-46). Then the bra rides up in the back and dumps her down in the front. Our custom fitted bras come in 8 styles with a total of 500 cup sizes. So large or small, we can fit you all. We have AA to N cups and every band size from 26-52. We can also refer you to have a custom-made bra up to 60JJ. Ordinary bras on the market today are only covers and give no support or direction. Because the breast is composed of fatty tissue and has no muscle, gravity pulls the breast tissue down, and also stretches the throat and neck tissue, giving your breasts the "ski slope" look. Breast disease is more likely when there is no circulation and or proper lymphatic drainage. Underwires can reduce circulation and drainage. Don't wear underwires. 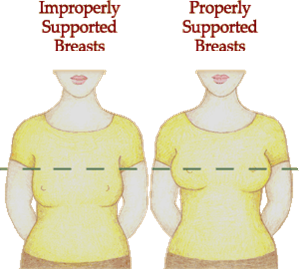 A properly designed bra lifts and supports the breast - providing more comfort and resulting in better posture. Our custom fitted bras are unlike any bra you have ever worn. Beauty by Jeunique bras are the perfect answer for everyday wear, and Jeunique has specialty bras for nursing and athletics. The secret? It's the exclusive patented Air-O-Flex Banderin® under the breast that creates a "shelf-type" support to encourage delicate bust tissue up and forward into the cup area, supporting and directing the bust. The Air-O-Flex Banderin® is composed of three layers; two outer layers of anti-absorbent material and a center section of EVA with perforations for a cooling, breathing effect. The Air-O-Flex Banderin® moulds to fit and support each breast according to its size and shape using your natural body heat The bandarin directional guides creat a trianglular space to hold you forward - directly out from the body, as nature intended. The fuller-figured woman will experience a sleeker figure and reduce any further damage to the shoulders, back and arms. The smaller busted woman will look better defined and lifted. Below are pictures of what a custom-fitted bra can do for you. Having trouble finding a bra that not only fits but also does the job it is supposed to do - lift you up, not let you down? Do you want to eliminate straps falling off or digging in, underwires that poke, sagging, bouncing when you exercise? Listen to Carol Orrell, Professional Bra Fitter and owner of World's Best Bras discuss these wonderful bras. Available in hundreds of cup sizes from 26 to 52 rib cages, and cups from AA to N. Come try one on! Call today for a private, personalized fitting and start looking and feeling better immediately.